The Poinsettia plant is a native of Mexico and South America, with its history tracing back to the ancient Aztecs, who saw the plant as a symbol of purity. The plants grow in the wild in deciduous tropical forests. Originally, they were cultivated for a practical reason—to make red dyes and medicines. It wasn’t until sometime in the 16th century that the plant became synonymous with Christmas. As Mexican legend tells it, there was a girl who was preparing a gift to celebrate the birth of Jesus, yet she had no money to offer a proper gift. The story continues that an angel came to her in a vision and told her to gather plants and weeds growing along the roadside and to place them at the altar of the church as a humble gift, given with love. There, they sprouted red and green leaves, leading the congregation to believe they witnessed a Christmas miracle. The festive plants became a popular part of Christmas around the world, and today are known in Mexico as “La Flor de la Nochebuena” or Flower of the Holy Night. Poinsettias were named in the United States in honor of Joel Roberts Poinsett, the first United States Ambassador to Mexico, who introduced the plant into the country in 1828. 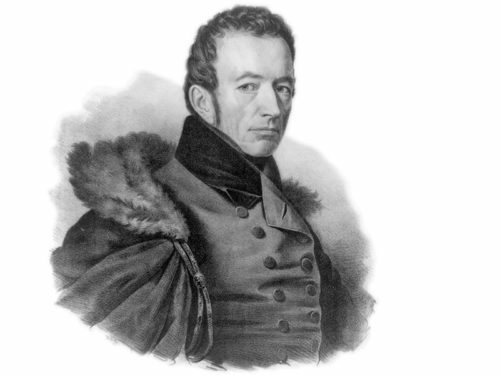 Poinsett was a botanist and physician. He sent cuttings of the plant he had discovered in Southern Mexico to his home in Charleston, South Carolina. December 12th is known as Poinsettia Day, due to the plant’s importance in the celebration of Christmas, as it marks the death of Mr. Poinsett in 1851. It wasn’t until around 1900 that the plants became available in the U.S. It seems we owe our gratitude for this to a German immigrant named Albert Ecke. He established himself in Los Angeles, California, where he and his son started an orchard and farm and began breeding and selling the quintessential holiday flower. The Ecke family developed a secret technique that caused every seedling to branch, which resulted in fuller plants. The Ecke Ranch is still going strong today. 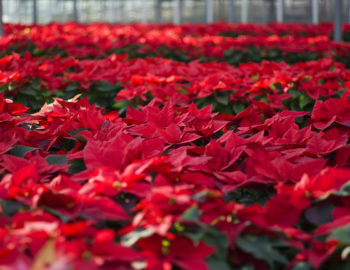 The farm grows over 70% of all Poinsettias purchased in the U.S. and sells approximately 50% of the plants worldwide. Poinsettias are part of the spurge family of plants, which is made up of over 7,400 plants. Many of the plants in this family, such as the rubber tree, cassava and tallow plants are used for various industrial applications. Many common succulents used as houseplants are part of this plant family as well. In nature, Poinsettias are perennial flowering shrubs that were once considered weeds. In subtropical and tropical regions, they can be grown outside year-round. In these regions, they grow as a shrub, and can reach up to 15 feet tall. They can also be pruned to form a tree. In other climates, they do best as a houseplant as they are not frost-tolerant. They prefer moderate moisture and full sun to produce their best color. Take care to move them out of the sun in the afternoon, as too much sun can result in the leaves burning. The red petals of a Poinsettia plant are commonly referred to as flowers, but they are colored modified leaves, also known as brachts. The tiny yellow flowers are clustered in the center of the brachts and do not attract pollinators. For the longest-lasting plants, choose a Poinsettia with little or no yellow pollen showing. Contrary to popular belief, Poinsettias are not poisonous. A person would have to eat a very large number of leaves to become ill, and would most likely only experience an stomach upset and vomiting. This is unlikely, as the leaves are quite awful tasting. Be sure to keep your pets away—as the leaves can be a choking hazard and could also cause your pet to experience nausea, vomiting and diarrhea. An NCAA college football bowl game in San Diego was named the Poinsettia Bowl. The first bowl was played in December of 1952 and was created as a military services championship game between the Western and Eastern military services champions. The last game was held in 2010 and is no longer played. Now that you’re in the know about America’s favorite holiday plant, feel free to pick one (or two or three) up next time you’re out to spruce up your holiday decor!